one thing that i've been trying to do is add some craft books to my bookshelf. i love making things but a lot of times i have no idea where to start. looking through craft books help me see tangible ideas & then i build on the ideas from there. Candy Aisle Crafts is a book that shows you how to make adorable crafts out of everyday items on the store shelf. these are inexpensive crafts that are fairly simple to put together but the cuteness is unmatched! you know how sometimes you find a really awesome craft on pinterest & you try your hand at it? and sometimes it really doesn't come out looking like the picture on pinterest? instead of a cute Olaf cake pop... yours kinda resemble scary redneck snowmen? 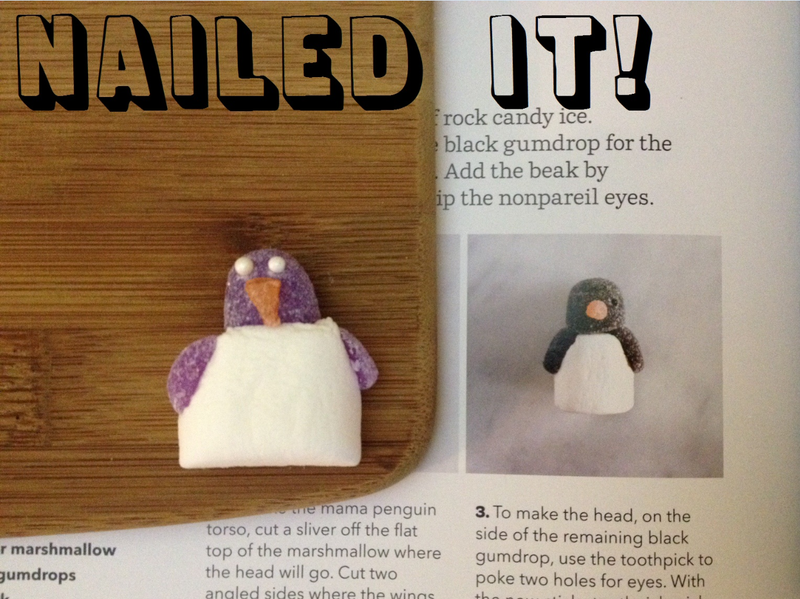 well, that is precisely what happened to Thomas & i when we tried to make these penguins! you know, the "nailed it" syndrome! you can laugh all you want at our penguins, because we sure did! there are so many cute ideas in this book & we can't wait to make more! (even if they look scary like these penguins!) these crafts are very simple & great to do with kids! we don't have kids, but we have a nephew that will be 3 this year & another nephew on the way! so we are excited to make some of these crafts with them when they are a little older! o4 stick the black gumdrop on top of the marshmallow & the wings onto the sides. i received a copy of this book from Blogging for Books for review purposes. regardless, all opinions are my own. have you ever had a "nailed it" moment? Very cute. My girls would love to make theses. they are SO simple - so a perfect kids craft!! if you guys make them - let me know how they turned out!! These are adorable! My daughter would LOVE making these! And I'm glad you used purple. I think black gumdrops taste like yuck! the black are really gross!! we went to 4 different stores & couldn't find them so settled on purple!! :) i hope you & your daughter make them and have so much fun!!! Oh my gosh - these are too cute!!!! Bwahahaha. Okay, you had me hooked as soon as you said they turned out scary. They turned out awesome! And purple gumdrops taste better than black ones, anyways! such a fun idea -- i'm sending you a picture of something similar!! that s'more guitar player is SO cute!!! :) i want to make one now!! haha thanks! :) they look good by themselves, but not when you compare to the book! lol purple for the win! !